Copycat Honey Baked Ham - Easy Slow Cooker Recipe!Copycat Honey Baked Ham - Easy Slow Cooker Recipe! 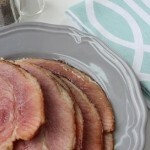 Try this copycat recipe to make a Honey Baked Ham in the slow cooker. So easy and so good! Unwrap ham and place flat side down in a large slow cooker. Throw away glaze packet and any plastic pieces that cover the bone. Rub brown sugar over the sides. Pour on maple syrup and pineapple juice. Baste ham with the juices from the bottom of the slow cooker.